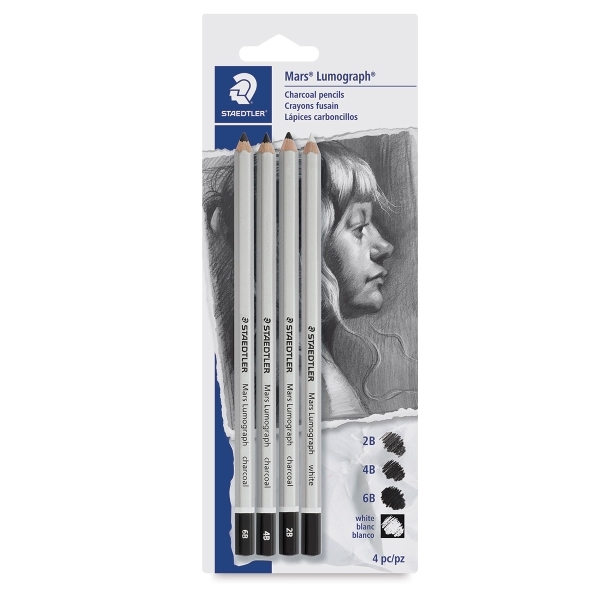 Mars Lumograph Charcoal Pencils are perfect for sketching, layouts, and adding details to finished artwork. These sets include charcoal pencils in three grades (hard, medium, and soft), plus a soft white chalk pencil for highlighting and blending. 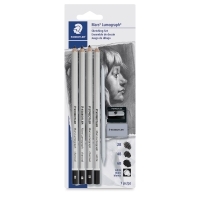 Set of 7 — Includes 2B, 4B, and 6B Charcoal Pencils, plus a soft white chalk pencil, a metal pencil sharpener, a kneadable eraser, and a double-ended paper stump. Set of 4 — Includes 2B, 4B, and 6B Charcoal Pencils, plus a soft white chalk pencil. ® STAEDTLER is a registered trademark.® Mars is a registered trademark. ® Lumograph is a registered trademark.